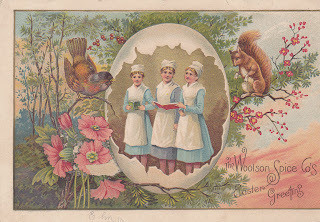 I might be tempted to take them back to the shop if three singing working girls came out of my egg. If the Woolson Spice Company ever send you an Easter gift it would be wise to treat it with caution. At any moment it might break open and you'd have three more mouths to feed. No wonder this one has been abandoned in the wild. So sad. 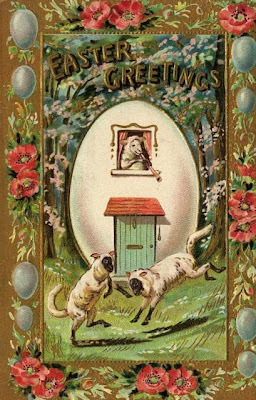 Moving on from eggs to chicks, here are a couple of frankly odd cards. 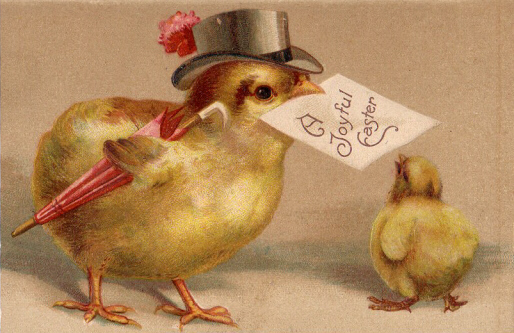 Here we see a traumatised young chick being terrified by the clown chick of Easter. I'm not just one of those people who says that clowns are scary for no reason. I once got road raged by a children's entertainer in full clown make-up. That sort of things stays with you longer than Tim Curry as Pennywise in It. Surely that 'lamb' at the back is just a chap in a lamb costume? 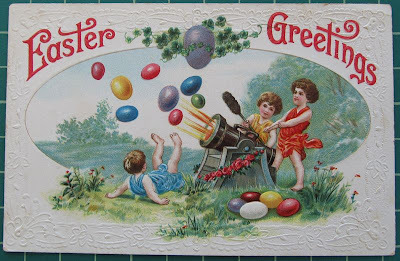 Rabbits are not an animal that I naturally associate with evil, but some of the Easter cards have the most disconcerting if not downright disturbing images involving Mr Bunny and his family, the above genetic mutation being one of them. 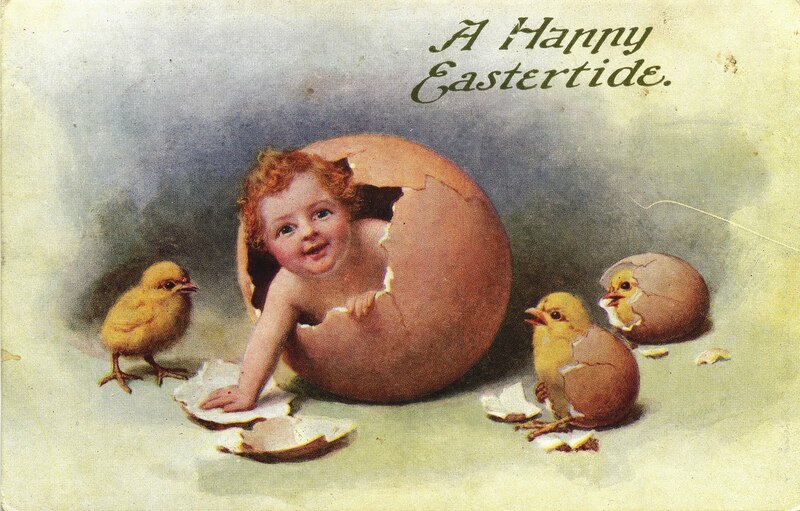 Again, I'm guessing the discussion went 'Easter means eggs and bunnies, so what could be more Easter-y than bunny eggs!' Say no to Animal Testing, my friends. Mrs Bunny doesn't look too happy about the amorous advances of Mr Bunny. Again, apart from the fact that they are stood in an egg (why?) 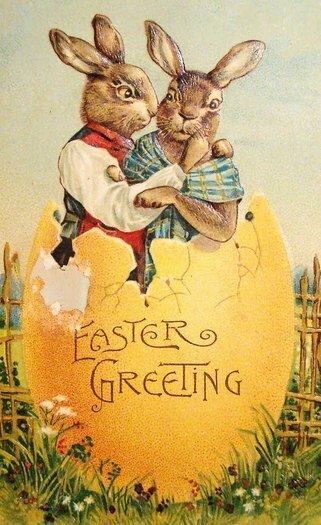 and they are bunnies, I'm not sure what this has to do with Easter, unless the 'Easter Greeting' they want you to have is slightly awkward and a little threatening. Talking of 'threatening', these are the most disturbing pair I have ever seen. 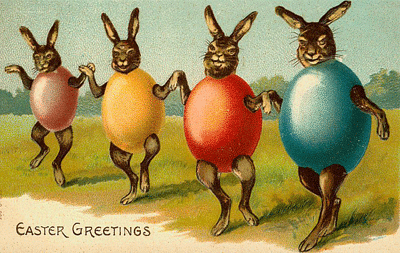 They belong to a notorious Easter gang who will corner you in an alley and steal all your possessions. 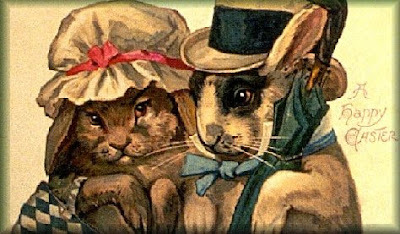 I named the file of this picture 'Mr and Mrs Bunny will rob you blind'. 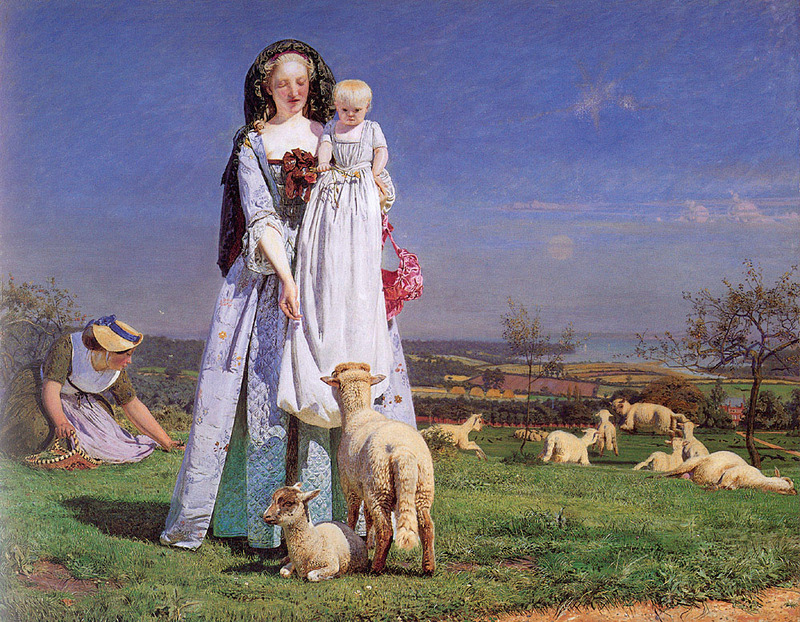 They remind me of the more chilling parts of Watership Down. Especially Mrs Bunny. She looks like she's hiding something vicious under her mopcap. If you were in any doubt who rules Easter, take a look at this little slice of wrong. 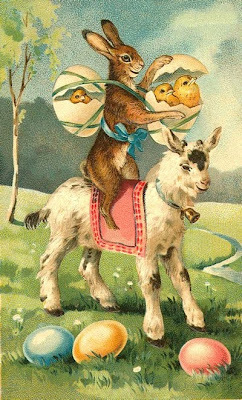 The Easter Bunny Overlord will ride into town on his Goat (since when are goats involved in Easter?! It's a sign I tell you, a sign!) with his little chick captives, to enforce some Easter Joy. Frankly, I'm too scared to say no. 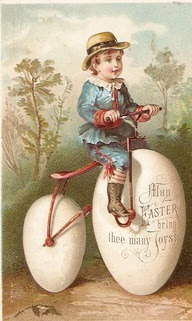 First,(Happy Easter!) thank you so much for these frankly disturbing images. I'm heading for the chocolate bunnies right now. Many thanks Rhissanna. 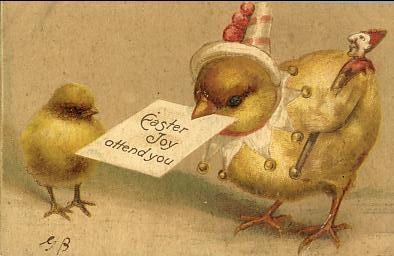 I think the evil bunny couple will haunt me for a while, they redefine malevolent. Well, I shall be with Daddy Stonell on my birthday as he recovers from having his wooden leg re-turned and so I think there will be very little scandal, but I can foresee some cake. This is me after all. A very fun read, your comments on the black-eyed bunny Easter gang in particular were hilarious. If I ever meet those bunnies in an alley, I'll run for my life. But down with Popery? I am aghast, agawk, aggrieved. Injured. Seriously though, while there was nothing offensive in what you said, and we all must have our little jabs at other sects after all, there's no need to decry Catholic iconography and art. After all, much of it is among the greatest of all time, such as the Sistine Chapel. But anyhow, this was a lovely read. Thank you! 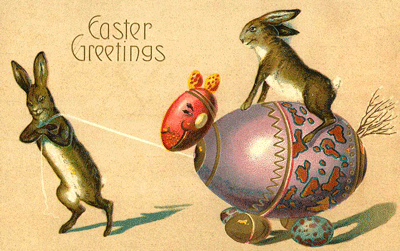 A little late to this, but I'm still giggling at the Evil *sorry* Easter bunnies! 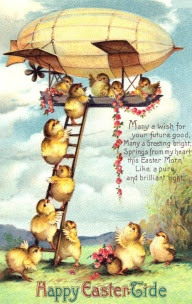 Thanks and I hope you all had lovely Easters. 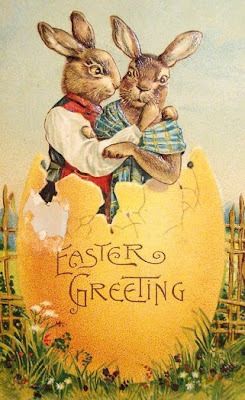 Pound Foolish, I was referring to the Victorian fear of Catholicism as being a possible reason why there were not more religious scenes on Easter cards rather than any religious intolerance of my own. I was also slyly quoting Father Ted who is a bit Catholic. My apologies for not making this more clear. 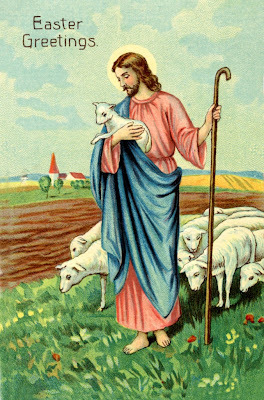 Incidentally, that you mentioned Jesus at all was quite pleasant. And really, the whole thing can be seen as a refreshingly different look at holidays and how they can become rather odd and pointless if you take away the religious origins, whatever your beliefs may be.